1. Hands-on Food: Let’s face it?kids prefer to eat with their hands. Finger foods make ideal meals for kids since you can combine a variety of small portions on one plate. Try partnering protein-packed Tyson 100 percent All Natural Chicken Nuggets with vitamin-rich green beans and complex carbohydrate-rich pasta for a mouth-watering, nutritious meal that’s easy to eat with little hands. What looks like fun to your child is a well-balanced meal that you can feel good about serving. 2. 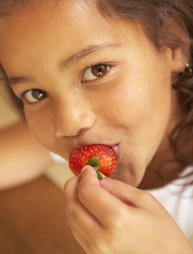 Name Games: Giving fun, creative names to everyday nutritious foods may have kids asking for more! According to a 2009 Cornell University study, when kids were offered “X-ray vision carrots” instead of plain carrots, they ate 62 percent more carrots. Try adopting this approach in your own house by giving silly names to a variety of foods, such as “cloud fluff” for mashed potatoes or “cheese in the trees” for broccoli florets topped with cheese. 3. Muffin Tin Meals: Set up a “finger-food buffet” and have your kids pick the items they’d like eat. Start with a muffin tin (or any small container with compartments) and customize the meal by filling the sections with bite-size portions of colorful, nutritious foods. Some great food ideas include: cubed cheese, whole grain cereals, grapes, sugar snap peas, baby carrots, and cherry tomatoes. Once you’ve filled the compartments, let them pick their items, allowing them to be hands-on with their meal. All parents have to be somewhat sneaky about doing these things....I remember I had a great brownie recipe that had beets in it! These ideas are good ones. When did eating become a game?? Our family is several generations of having the kids help in the organic garden and kitchen when they are little, they love to eat what they've helped create. And kids also love to eat what their parents eat, if you tell them it's yummy, they'll love most of it too. I even had a vegetable stand in my front yard as a kid. I think if you start children off eating a variety of things when they are young you will have no problem with them eating when they are older. My daughter has always loved vegetables, we have always had a rule that if I would not eat it, I would not ask her to try it. Then if she did not like it she did not have to eat any more of it. Her and I were shopping one day when she was younger...she is 13 now...we were shopping in the grocery store, and we were in the produce dept and a woman stopped me and asked me how I got my child to eat and pick out veggies. We both laughed cause it never hit me that some children don't eat veggies and the like.